The running order is set for Just Listening, this Saturday 30 April in Limerick. Please come down to the beautiful Limerick School of Art & Design Gallery on Clare Street where you will be treated to an ear-opening experience: 15 performances by the most innovative sonic artists in Ireland. I am proud to be in such a line-up, taking the stage at 3pm or thereabouts. Coming right on the heels of my collaboration with Mick O'Shea and Danny Mc Carthy at Strange Attractor in Cork, this performance will display a line of inquiry I premiered at the Valentine's Day gig this year. 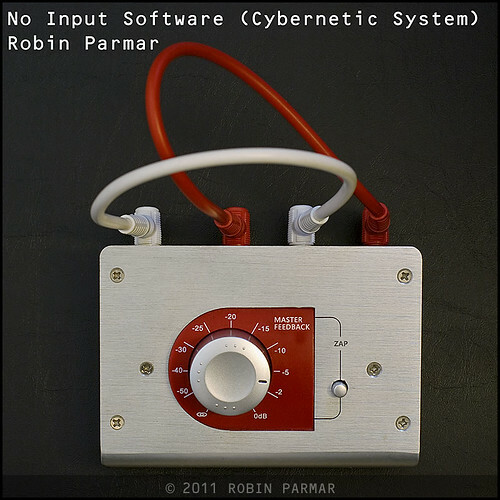 In brief, I will be performing my No Input Software, a cybernetic circuit that puts me in the position of responding to the chaotic interactions of an emergent software system. To get an idea of what it might sound like, check out the first two tracks on my listen page. But it might just sound very different... chaos is like that! 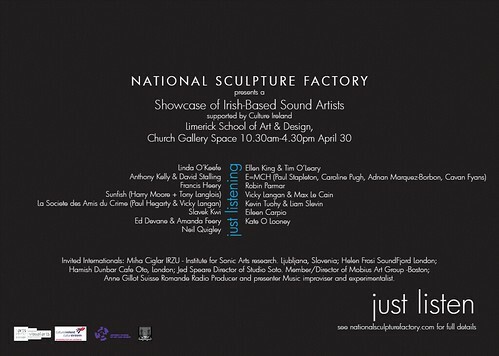 Curators from USA, Switzerland, UK, and Slovenia have been invited by the organisers of the Just Listen festival, the National Sculpture Factory, Cork. I extend a warm greeting to our visitors and look forward to meeting everyone on Saturday! For further details on my process, read the post from February.